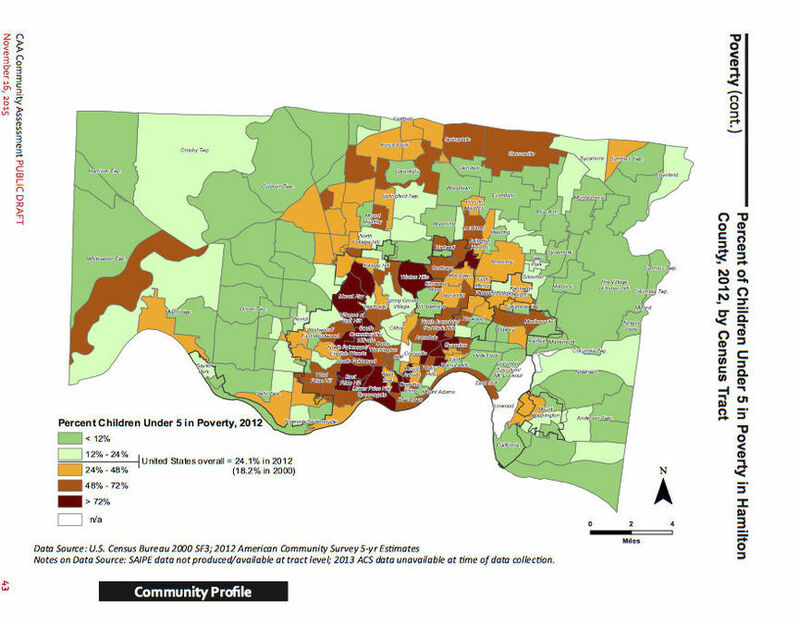 CINCINNATI — If you have a hard time believing what you've heard or read about how our region's childhood poverty problem is spreading , maybe these two maps will convince you. They're on pages 42 and 43 of a new report commissioned by the Cincinnati-Hamilton County Community Action Agency. And they show how much the geography of childhood poverty has changed in less than a generation. "In 2000, not that long ago, poverty was in central Cincinnati and a few more rural locations," Liz Blume told me. She's director of the Community Building Institute at Xavier University, which did the study. The map on page 42 shows what she means. 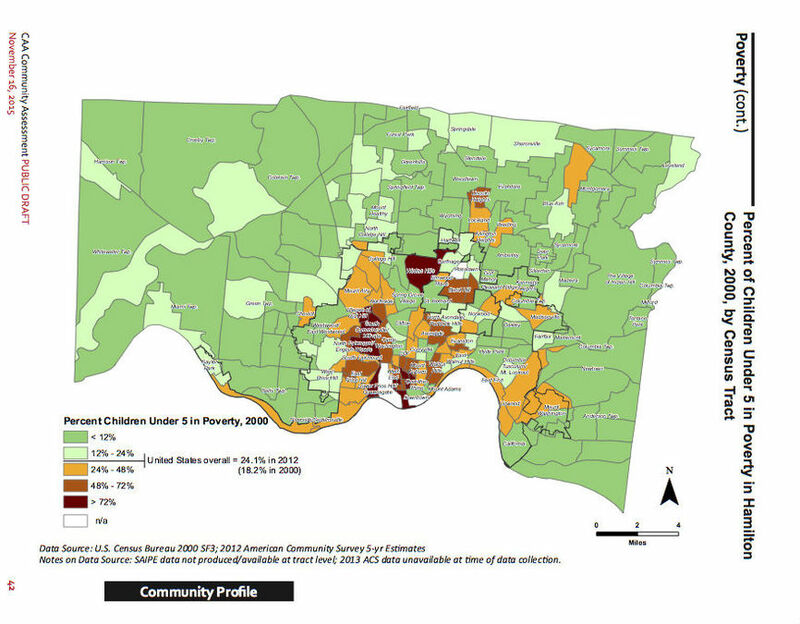 Dark red and rust represent the highest concentrations of poor children under the age of five in Hamilton County in the year 2000. Those colors appear in neighborhoods near Downtown and its government offices and social service agencies — neighborhoods such as Walnut Hills, Avondale, Over-the-Rhine and South Fairmount. But the map on the next page shows just how much that has changed. "Now it's much more dispersed," Blume said. "It's in suburban communities all over the county that have very little capacity to deal with it." The map on page 43 is based on 2012 U.S. Census Bureau data, the most recent, detailed information available when the institute was completing the study. That map shows how childhood poverty spread, with dark red and rust representing concentrations of poor kids under the age of five in Mount Airy, Mount Healthy, Winton Hills and even Springdale and Sharonville. The contrast between the two maps is clear, and it has even surprised people whose attention is focused on poverty in Hamilton County, said Gwen Robinson-Benning, the longtime president and CEO of the Cincinnati-Hamilton County Community Action Agency. When Blume did a presentation for local civic, political and community leaders last year and showed them the maps, "everybody was quiet," Robinson-Benning said. "We're a visual society," she said. "It really showed me." Those maps are just two pages in the 121-page study packed with data from the U.S. Census Bureau and other sources and insights gathered from a survey of about 1,200 Community Action Agency clients and focus groups with school community resource coordinators, mental health providers and, perhaps most importantly, adults and children living in poverty themselves. The report is expected to help inform the work of the Child Poverty Collaborative , the group of high-profile clergy, civic and business leaders with a goal of lifting 10,000 children out of poverty within five years and helping 5,000 unemployed or underemployed adults get jobs. Lynn Marmer, who will serve as executive director of the collaborative starting Feb. 1, said what the group has seen in the study so far is "sobering, eye opening and very helpful." "Even more important than data will be the voices of our neighbors who live in poverty, those who are on the fragile cusp of family self-sufficiency and those who work day-to-day with parents and their children who are on their own personal journey," Marmer told me in an email. "I like to say, this work will be a combination of head, heart and hands. The CAA study is most definitely a primary informer of the work ahead." • The "welfare cliff." This term describes when people work in low-wage jobs and end up losing government benefits that are worth a lot more than they earn. • Mental health and well being. Living in poverty for most families means uncertainty and chaos, and the stress that creates can take its toll on the ability of parents to be good moms and dads and the ability of kids to learn and behave in school. • Whole family supports. Many programs are designed to help just adults of just children, but helping the whole family would have a much greater impact. • Transportation. Unless you have a car, it can be very difficult to get around in Cincinnati and Hamilton County. And the poor public transit system compels people to buy a low-cost car as soon as they can afford one. Often, that means people buy unreliable cars that they can't really afford and end up with repair bills they can't pay and still no efficient way to get to work. • Fragmented, disconnected services. Families living in poverty struggle with the lack of coordination among programs and services that are available to help them. Most programs have different application requirements, and teachers who know kids best don't have time to coordinate with mental health providers. On top of all that, there are distinct types of poverty described in the study. A family that is poor because of a job loss, big medical bills or some other debt is experiencing "situational poverty." Families in "generational poverty" come from backgrounds where poverty is all they have known, and they have a hard time seeing themselves any other way. "Urban poverty" describes people living in communities where there are few jobs, failing schools and violence. The study as a whole paints a heartbreaking picture of poverty in Hamilton County and the children caught in its clutches. "It is not easy to be poor in Cincinnati," Blume said. Community Action Agency is one of those organizations locally that can provide families with "the first grab they make onto somebody who's solid," Blume said. That "grab" can start by enrolling a child in the agency's Early Head Start program and then learning about the Home Energy Assistance Program, or HEAP, administered the agency, which helps Hamilton County residents with utility bills. And the region could offer those families even more support by helping them make connections to each other and the communities where they live, Blume said. That way working parents would know their neighbors down the street who are trustworthy and available to help them out when a kid gets sick or a car breaks down or an overtime shift becomes available at the last minute. "It's the way that you connect the dots that everybody has always connected the dots," Blume said. "But in low-income neighborhoods, all of that stuff gets disconnected because people don't trust each other because they're worried about crime and violence." Robinson-Benning knows from personal experience how important those connections are. Years ago when she was running a recreation center in Illinois, she was pregnant and having marital problems. She had formed a woman's group at a local housing project, and she confided to the ladies there that she was worried about delivering her baby after she and her husband had separated. "They looked at me, and they said, 'We got you,'" Robinson-Benning recalled. Those women supported her through her last month of pregnancy. They told kids at the recreation center who to notify if Robinson-Benning had to go to the hospital, and they helped her out with diapers and all the tips a new mom needs. She sees the same type of support play out at the Community Action Agency every day, she said. "When I listen to the Head Start moms, at least 40 percent of my staff are single parent heads of households," she said. "They already know what they know." And they're happy to share what they know with the parents who drop off their kids each day. Fixing our childhood poverty problem isn't going to be easy, to be sure. But despite the sobering data in the Community Action Agency study, talking with Blume and Robinson-Benning encouraged me. Helping people in poor communities make stronger connections won't solve the problem. But it could provide families with an important safety net for their kids in the meantime. "People think that families who are struggling with poverty are somehow different than everybody else," Blume said. "They're not. Everybody wants to take care of their kids." And from time to time, all of us parents have needed some help with that. Lucy May writes about the people, places and issues that define our region – to celebrate what makes the Tri-State great and also shine a spotlight on issues we need to address. Childhood poverty is an important focus for her and for WCPO. To read more stories by Lucy, go to www.wcpo.com/may . To reach her, email lucy.may@wcpo.com . Follow her on Twitter @LucyMayCincy.